① Add the rice, water, and konbu to a rice cooker and cook the rice. ② Combine the plum vinegar and sugar, and mix until all the sugar is dissolved to make the sweet plum vinegar. When the rice is done, transfer it to a large mixing bowl. Pour the sweet plum vinegar evenly over the rice and mix with a cutting motion until the rice begins to glisten. ③ Place a paper towel on a plate or metal tray. Add the sesame oil to a frying pan and put the pan on medium heat. Add the chirimenjako to the pan and fry until they become crispy, then transfer them to the plate or tray to allow the paper towel to absorb the excess oil. ④ Cut the green shiso into thin strips. Cut the roots (thin, hair-like ends) off of the kaiware. Cut the cucumber into thin rounds (a couple mm thick at most). Place the rounds into a bowl and sprinkle 1/4 tsp of salt on them. Set the bowl aside for a few minutes, until the cucumber rounds soften, then drain off the water. Crack the eggs into a bowl, beat them, and add a pinch of salt. Place a frying pan on low heat. Add the egg and use cooking chops to vigorously mix the eggs. 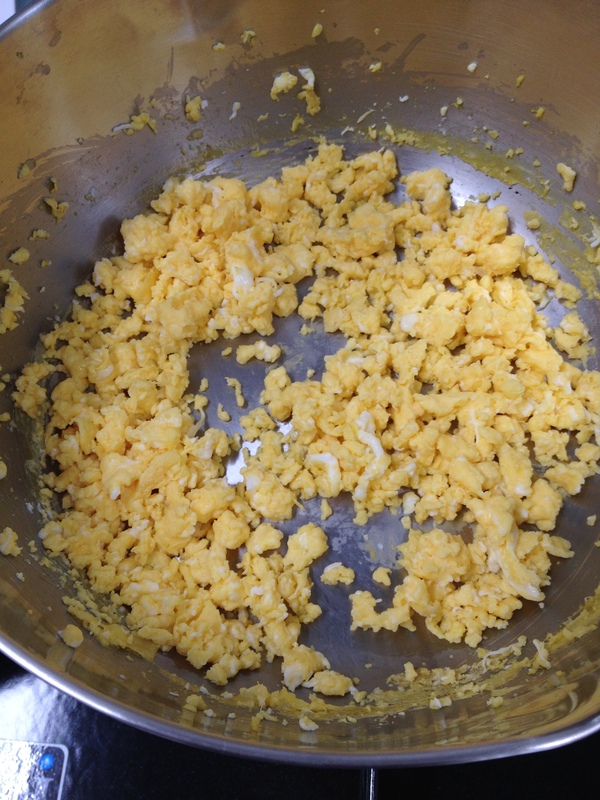 The goal is to make small crumbles of scrambled egg. 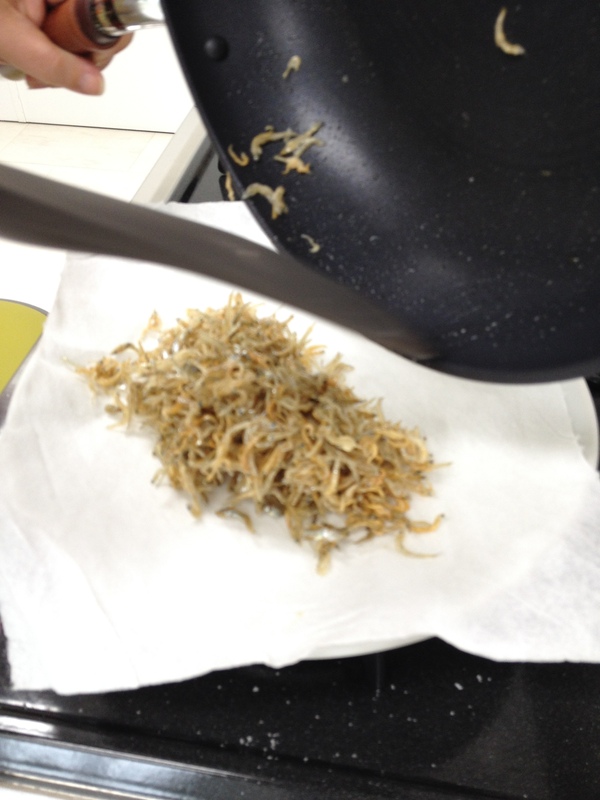 ⑤ Use a plum-flower die to cut plum-flower shaped oblongs out of the daikon and then cut these into thin slices. Place the slices into a bowl and sprinkle on 1/2 tsp of salt. Set the bowl aside for a few minutes, until the daikon slices soften, then drain off the water. 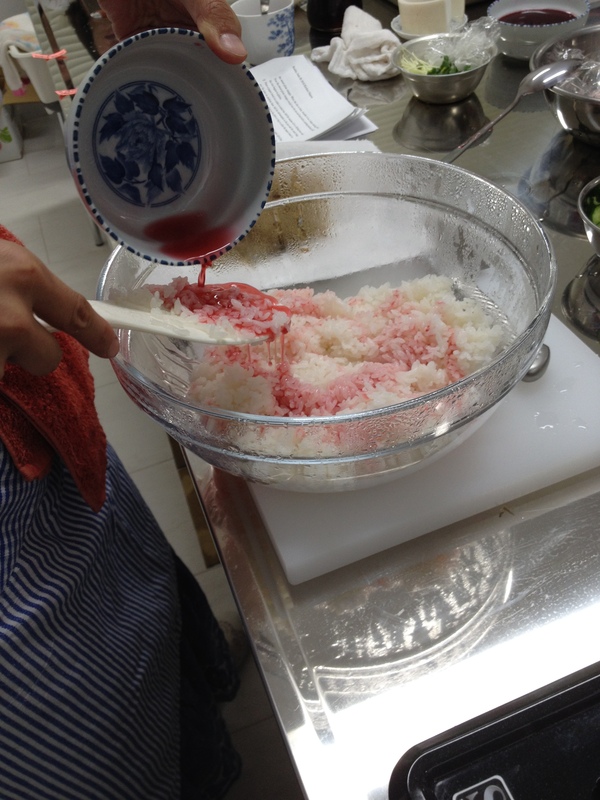 Dissolve the sugar into the plum vinegar and add this to the bowl with the daikon slices to give them a pink hue. ⑥ Mix the chirimenjako, cucumber, green shiso, 2/3 of the scrambled egg, and the white sesame seeds into the plum-vinegared rice. Arrange the rice on dinner plates. Top with the kaiware, the remaining 1/3 of the scrambled egg, and plum vinegar daikon pickles.